On November 9, the Supreme Court decided to review Section 5 of the 1965 Voting Rights Act. The law has been essential to battling forces that sought to disenfranchise minority voters. 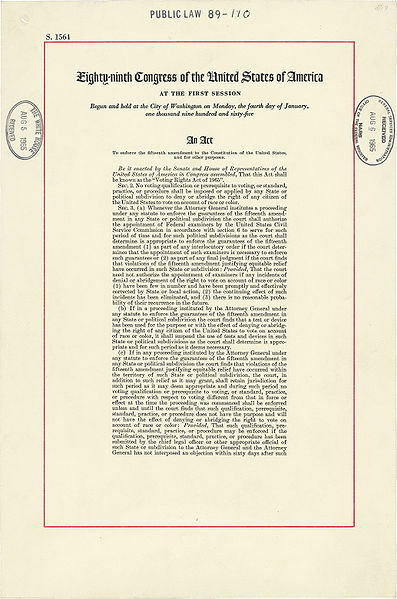 This section requires nine states — Alabama, Alaska, Arizona, Georgia, Louisiana, Mississippi, South Carolina, Texas and Virginia, plus scores of counties and municipalities in other states with known histories of racial discrimination — to obtain permission from the Justice Department or a federal court before altering their voting rules. The case now heading for the highest court in the land, Shelby County v. Holder, was brought by an Alabama county near Birmingham, which argues that Section 5 encroaches unconstitutionally on the sovereign authority of states and that federal appraisal of proposed voting changes, once obligatory to end legal segregation, is no longer required. Anyone who needs convincing that the shadow of slavery and discrimination still haunts the United States need look no further than the fact that only this month has Mississippi completed ratification of the 13th Amendment to the Constitution, abolishing slavery.